George W. Camp (1905-1998) was a member of the Southern Michigan Railroad Society in the mid-1980s, and submitted three articles for publication in the SMRS newsetter, The Cross Tracks, based on his experience of working on the Michigan Central Railroad in the 1920s. I am republishing these articles on the blog as they represent a first-hand observation of railroading at that time. The best days of the steam locomotive were in the late 1920’s just when the automobile was beginning to get popular. There were no super highways to travel on with the automobile and not too many paved roads that could stand truck traffic; therefore most passenger travel was by train, which also carried mail, express and baggage. Most of the freight business was by car load lot. In this series of articles I will attempt to explain the operation of the railroad on which I worked in the late 1920’s. Also the care and maintenance of the steam locomotive. My experience in this field was four years as a machinist and locomotive repairman apprentice and two years as a fireman. The line I worked on was known at the time as the Michigan Central Railroad (a New York Central Line) at Niles, Mich. The main line of the Michigan Central was from Detroit to Chicago, with branch lines from Detroit to Bay City and Mackinaw City, also Toledo and from Jackson to Grand Rapids and Jackson to Lansing. There was a short line from Niles to South Bend, Indiana and from Galien to St. Joseph. Another line known as the Air Line from Jackson to Niles via Three Rivers. This route was about twelve miles shorter than the Main Line between these two cities or terminals. All branch lines were single track but the Main Line was double track and all branch lines had passenger service. The Main Line was divided in three divisions. Detroit to Jackson was the East Division, Jackson to Niles, including the Air Line, was the Middle Division, and from Niles to Chicago was the West Division which included a single track line from East Gary, Indiana to Joliet, Illinois, about 44 miles. From Calumet Park, Indiana we ran on the Indiana Harbor Belt Line, which was owned by the Michigan Central, to Blue Island and Argo, Illinois. It was at Argo that switch crews brought the meat cars out from the packing plants and made up the trains. At that time the packing plants were enjoying a good business. More of this later. 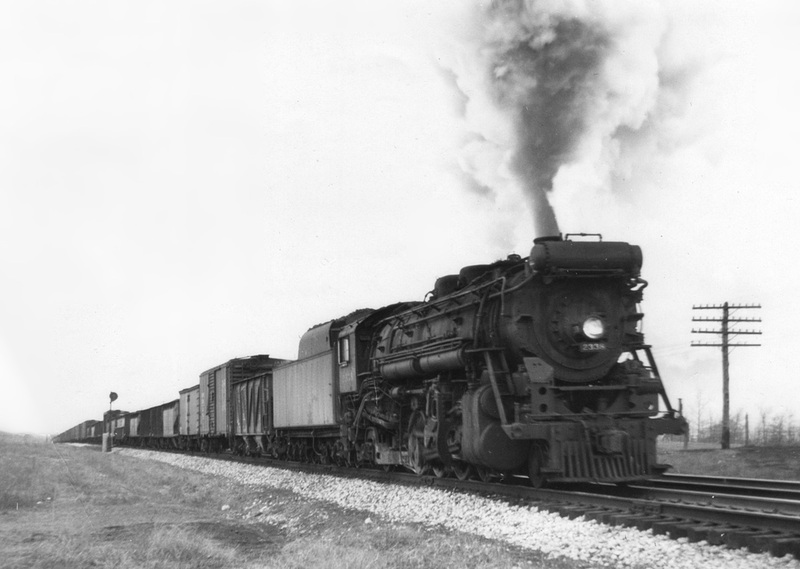 The line to Joliet was used exclusively for freight service. The West Division terminal was moved from Michigan City, Indiana to Niles in 1919 when the Government had control of the railroads. A new yard was built there, which was about three miles long. It consisted of a receiving yard of about eight tracks, a hump for switching oars and a classification yard of about 24 tracks, where trains were made up. There was the same for both East Bound and West Bound yards. Also, there was a Rip Track for repairing box cars, a thirty pit round house, a back shop that could accommodate six engines for overhaul, machine shop – blacksmith shop along with a coal dock – water spouts, ash pits necessary for operation. Major locomotive repairs were done in Niles, Jackson, and Detroit. The two most important elements to locomotive travel were water and coal. Water could not be too far away at any time and most towns had a water tower. The Michigan Central was one of the few railroads in the country that had track pans for scooping water “on the fly”. There were six track pans on the main line, two on each division and two on the Air Line. There were two coal docks on the Main Line – and one on the Air Line. Traffic on all lines was controlled by a train dispatcher on each division. On the West Division the dispatcher’s office was in Chicago. In every depot, was an operator who carried out the commands of the dispatcher. It was his duty to inspect trains as they passed by his station and if there were any irregularities he advised the dispatcher by phone. When a train was to go onto the passing track (side track) at his station, he controlled the signal that instructed the train crew to do so as they approached his station. The train dispatcher had to know the movement and location of every train on the division and every train that was to enter onto the division. When train had passed a station, the operator advised the dispatcher of the time of clearance without delay. To control traffic on the Main Line was the Automatic Block System. These signals were about a mile apart. When a train passed signal #1 – it showed red and its arm in a horizontal position. When it had passed by #2 signal – it turned red and #1 signal turned yellow (caution) with the era at a 45° angle. When the train had cleared #3 signal – #2 turned yellow – #1 turned green with the arm in a vertical position. A red signal demanded a stop. With automatic train control, if an engineer failed to acknowledge a yellow or red signal as he passed it – the train brakes automatically went into action. The Automatic Train Control is governed by the Automatic Block System. In event of a brake action set off by the Automatic Control, there is nothing the engineer can do to release the brakes. If he placed his train line brake lever in full release, it would have no effect on the brake action – the train would come to a stop. Then it would be necessary for the fireman to get down from the engine on the right side – go to almost the rear of the tender – and underneath near the frame, well enclosed, is a reset button. After that is pushed – the engineer could latch in his brake lover and release the brakes. Automatic Train Control was introduced in 1927.